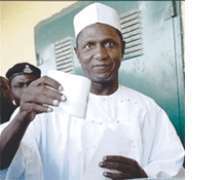 The presidential candidate of the ruling People's Democratic Party (PDP), Alhaji Umaru Yar'Adua, has been declared the winner of Nigeria's controversial presidential election, according to official results. Alhaji Yar'Adua obtained 24.6 million votes, while his closest challenger, Gen Muhamadu Buhari of the All Nigeria People's Party (ANPP), had 6.6 million, the Independent National Election Commission (INEC) declared yesterday. Vice-President Atiku Abubakar of the Action Congress (AC) followed a distant third with 2.6 million votes. Twenty-five presidential candidates contested the election. He said party agents would have the chance to review the results, while election officials had been invited to come and defend their actions. Results released by the INEC showed that Yar'Adua's party also made a sweep of the Senatorial and House of Representatives seats across the nation, especially in the southern and south-western parts of the country. The AC, led by Vice-President Atiku, won all the 17 House of Representative seats in Lagos and the East Lagos Senatorial, as well as the presidential votes. The AC and the ANPP have, however, declared their intention to contest the outcome of the poll in court, which had also been slammed by international observers as being marred by irregularities, intimidation, wrong use of logos and late arrival of materials. Speaking at the Nnamdi Azikiwe Airport in Abuja, on Sunday, Atiku, who lost in his ward at Ajiya in Yola, indicated that he would use the courts to contest the outcome of the poll. Atiku, who was cleared for the election hours to the poll, said his decision was to help avert the imposition of a one-party state. He said no election took place in Nigeria and that only a symbolic election was held in the state capitals and urban areas to give an impression of voting. He also alleged that ballot papers were distributed to unnamed governors and party agents to promote electoral fraud across the country. Atiku said the coalition of opposition parties would meet to review the outcome of the elections and fashion out an appropriate response to the political situation in the country. He reiterated his claim that the elections were the worst conducted in Nigeria since independence. The elections have been condemned by almost all the international observer groups which observed them. Earlier, the Commonwealth Observer Group had said the elections were marred by significant shortcomings. It called on the INEC to ensure utmost transparency during the tabulation and processing of the final results. The Conference of Nigeria Political Parties (CNPP) also called for the cancellation of the results. It described the elections as “a monumental fraud unparalleled in the history of the country”. The International Republican Institute (IRI) team of observers described the general election as “a classical example of how a government can fail its people”. Delivering its preliminary verdict on the elections, Ambassador Pierre Richard Prosper, the former US Ambassador for War Crimes, said the system failed the Nigerian people. “The system as designed did not work,” he added. The President of the Independent Electoral Commission of DR Congo, Muholongo Malumalu, said he had monitored elections in nine African countries and had never seen such logistical problems before. The IRI's statement said recurring incidents of underage voting, voter registration errors, group voting, party observers and policemen instructing people on who to vote for, lack of privacy for voting, lack of results sheets and falsified results sheets all worked to discredit the polls. “The April 14 and 21 elections failed to match even previous Nigerian standards,” it added. Nigeria's biggest local election observer group, the Transition Monitoring Group (TMG), on Sunday called for the entire presidential election to be cancelled. The TMG's Chairman, Mr Innocent Chukwuma, said the presidential election was so badly flawed that it should be cancelled and held again. “We are going to call for a re-run of elections. You cannot use the results from half of the country to announce a new President. The TMG boss also accused the INEC of poor preparation for the election. The agency reported that the elections were marred by violence, intimidation and fraud, a far cry from the credible democratic vote many had hoped would usher in the first hand over from one civilian president to another since Nigeria's independence from Britain in 1960. Meanwhile, the embattled INEC Chairman, Prof Iwu, who had been roundly criticised for the conduct of the poll, says the elections recorded a success rate of 80 per cent. He said elections would be re-run in states and constituencies where voting was either marred or did not take place at all.